City Year is an education-focused nonprofit organization that partners with high needs public schools to enhance the quality of the learning environment in the areas of attendance, behavior, and course performance. This is achieved by deploying teams of City Year corps members to the schools. The expectation is that students who receive support from City Year corps members in the areas of English, math, attendance, and behavior will show growth in their academic and behavioral outcomes. With funding from the William Penn Foundation, City Year is being implemented in 11 high needs public schools within The School District of Philadelphia (SDP or District); targeted support is provided to at-risk students in grades 6 to 9. 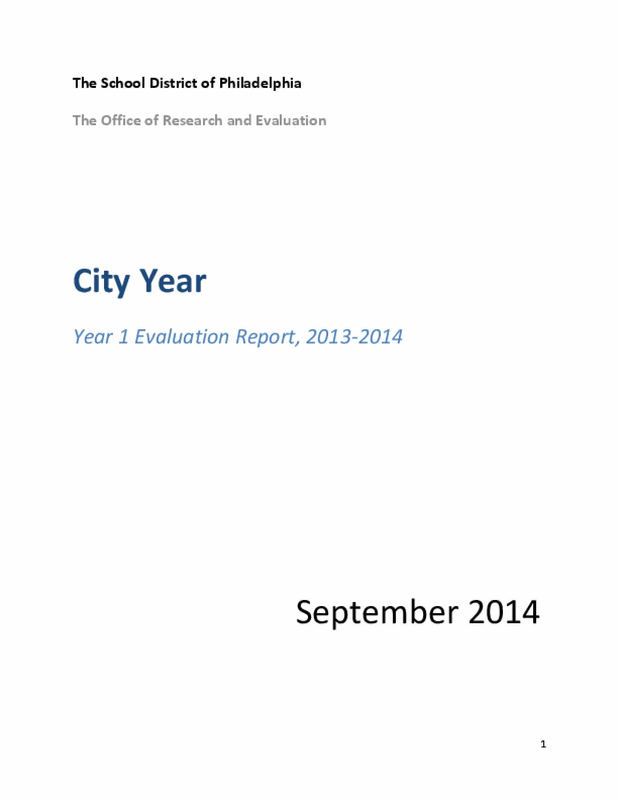 The Office of Research and Evaluation (ORE) is currently evaluating City Year's effectiveness in meeting the above goals for the 2013-2014 school year (SY) – Year 1— and extending into the 2014-2015 SY – Year 2. Copyright 2014 by The School District of Philadelphia's Office of Research and Evaluation. All rights reserved.